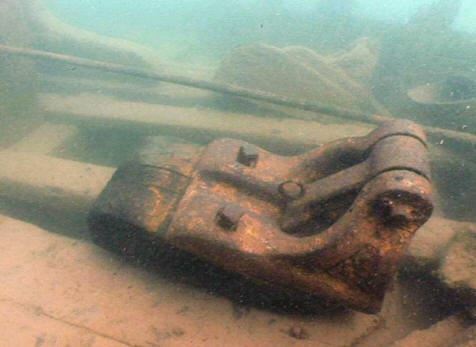 This year in June, in cooperation with Wisconsin Historical Society, we returned the anchor chain stop to the schooner Lucerne that was wrecked just over 120 years ago in the Apostle Islands (photo below). The Lucerne lies in 17 feet of water off of Long Is in the Apostle Islands National Lake Shore and is a popular dive site in the area. 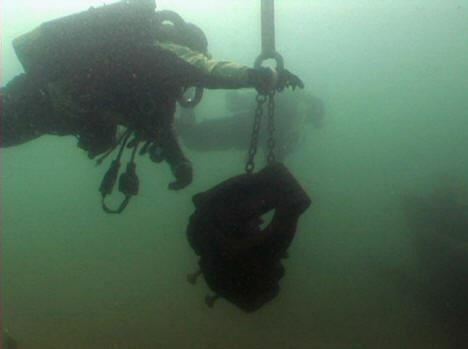 The chain stop had been mistakenly removed by an ambitious diver, and had been in storage for quite a few years. The GLSPS Put-It-Back team consisting of Ken Merryman, Bob Olson, Mark Yanik, and Paul Imsland traveled to Bayfield, WI to load the chain stop onto the Heyboy for its return journey to the Lucerne. We were met that warm June morning by Wisconsin State Archeologist John Broihahn who was along to observe our activities and photograph the PIB event. The first and biggest challenge of the day was to place the nearly 400 lb. 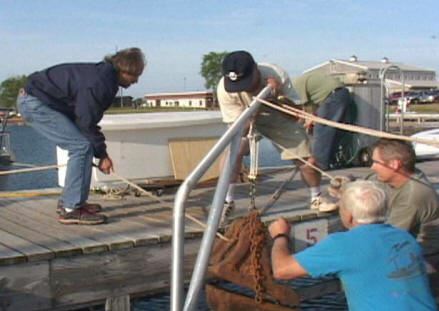 chain stop on the stern of the Heyboy, without creating a new shipwreck site in the Bayfield marina. A big concern of the captain was the draft between the Heyboy keel and the lake bottom, knowing that the Lake Superior was at record low levels. Plus dropping the chain stop onto the platform could damage the platform and adversely affect the season's charter business. 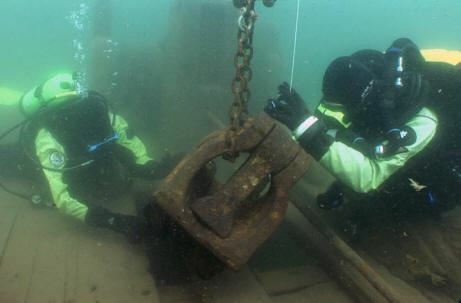 Strong arms and a stronger rope allowed us to gently place the chain stop on the rear dive platform of the Heyboy. After it was secured, the chain stop appeared to add less weight to the Heyboy than a charter group of tech divers on their way to the Kamloops, so Captain Ken breathed a sigh of relief. Clear skies and a light breeze accompanied us as we headed out of Bayfield and turned south towards the wreck site off the north end of Long Island in the South Channel. As the wreck had not yet been marked for the summer, Ken used GPS coordinates and his depth finder to drop the first diver, Paul Imsland, onto the wreck to locate the front mooring, just off the port side of the Lucerne bow. Bob Olson then chained the chain stop to a 500 lb. lift-bag and Paul carefully dropped it off the Heyboy platform away from the wreck. 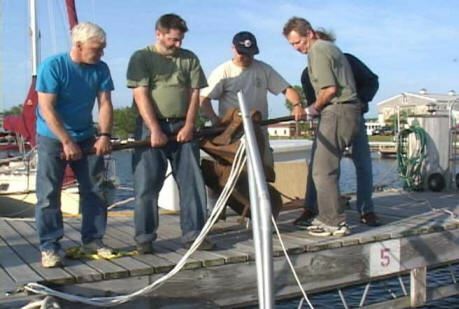 While suspended at 10' by the lift bag, they manuevered it over the Lucerne starboard bow and positioned so that the chain stop bolts mated with the deck holes that originally fastened it to the deck. It was then gently lowered in place. It now sits securely on deck in its original position next to the port chain stop. All the while that the Lucerne chain stop was being PIB'd, we were photographing and videoing the event, both over and underwater. The next day, Wisconsin State Archeologist John Broihahn and GLSPS Board Member Pete McConnell presented much of this video of the PIB project at the Madeline Island Museum as part of it's "Lucerne Days" activities. Other GLSPS projects were discussed to an attentive Bayfield audience. The GLSPS is proud to cooperate with the Wisconsin History Society on the replacement of the Lucerne chain stop in the Apostle Islands. As you can see, it takes the talents and volunteer efforts of many people to make a GLSPS project happen. If you have an interest in restoration, diving, tending, photographing, or public presentation, we welcome you to join in the efforts of the GLSPS and to assist with our current and future projects. 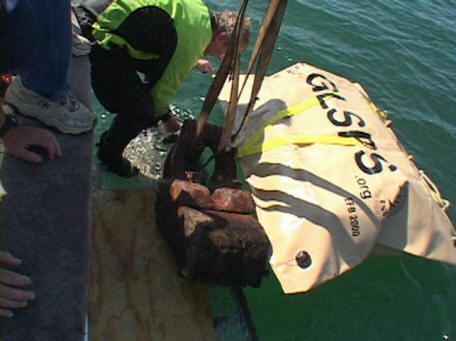 If you have, or know of, historic maritime artifacts that have been salvaged from underwater shipwrecks in the Great Lakes, the GLSPS is interested in evaluating them for replacement on the actual underwater shipwreck site or in a nearby maritime museum. We will work with appropriate local and state agencies to ensure that the artifacts are correctly restored and secured so that others may view them and enjoy their historical significance. Please contact us with any questions you have regarding maritime artifacts, whether you have something to return, or are interested in helping us restore and display shipwreck artifacts. 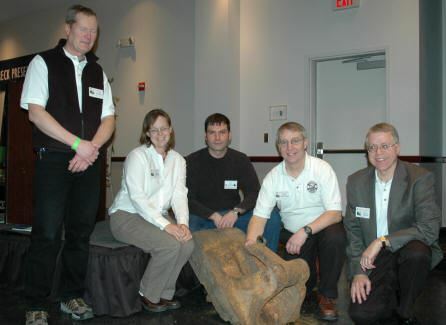 Keith Meverden and Tamara Thompson of the Wisconsin Historical Society delivered the heavy chain stop to GLSPS at the Dive Into the Past Show 07. 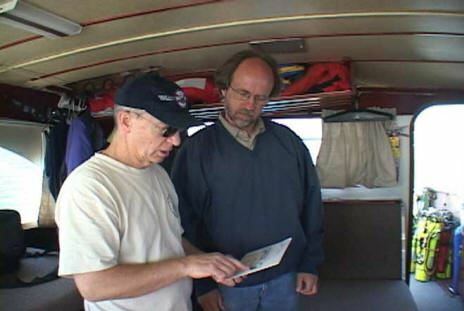 Ken Merryman discusses the plan with John Broihahn, Wisconsin State Archeologist, aboard the Heyboy while Mark Yanik is behind the camera. The first job was moving the 400 lb chain stop from the van to the boat. The heavy chain stop was more than our davit was rated to handle so we had to add extra muscle to gently lower it on to the dive platform. Bob Olson fastened the chain stop to the lift bag and Paul Imsland rolled it into the water away from the wreck. Bob Olson steers the chain stop to its final resting place. Bob and Paul gently lower the artifact to its original position. The original mounting holes were still visible to guide the positioning. It now rests in its original position for the diving public to enjoy.